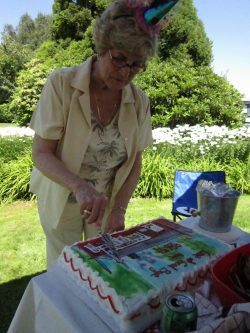 Mescal Jean Smith, always known to us by her middle name, died last week at her home in Tygh Valley, Oregon. Her daughter-in-law kindly called to let us know. 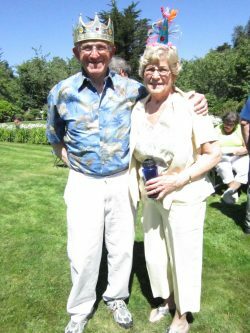 Though Jean and John moved from Oysterville almost six years ago, I feel Jean’s absence more since that phone call than in all the years since they left. Somehow, they have remained ‘present’ despite our sporadic communication. Meanwhile, Jean and John (but mostly Jean) ran the store. John was still working in Oregon; for years we saw him only on the weekends. 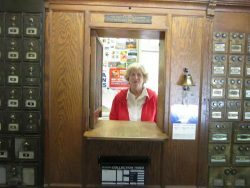 By the time John finally retired and moved to Oysterville full-time in 2001, Jean was working as the PMR (Postmaster Replacement) at the Post Office as well as keeping an eye on the store. Somehow, she also had time to grow tubs full of gorgeous tulips, nip outside to give doggie treats to her canine friends, and wave hello to the neighbors on her noontime walks through town. She had worked and walked her way into our community and into our hearts and had brought John right along with her. Soon, in 2002, she was officially appointed Oysterville Postmaster and John was minding the store full-time. It was a natural division of labor and it seemed as though it had always been that way. Indeed, now, almost two decades later, there are many store customers and postal patrons who don’t remember life ‘BJJ” – before Jean and John. “Not very well,” Jean’s daughter-in-law replied. It wasn’t clear that he fully understood that Jean had died. “His son will be taking him to Arizona to live with them,” she said. And we were quiet for a while. I’m not really sure where Jean’s Beach is, but we plan to be there. Oh my goodness !! I worked for John and Jean in the store many times. It is difficult to imagine that she is gone and then John and his illness. They were both very good to me and I enjoyed working in the store. Of course Roger delivered the mail and was friends with them. Thanks for the news and the nice review you gave in your blog.